Consul General of Japan Hon. 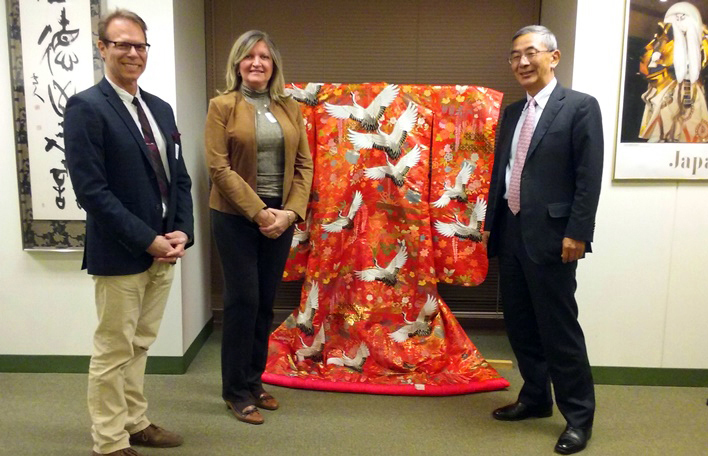 Toshiyuki Iwado, Fulbright Association Chicago Chapter President Mary Mares-Awe, and Vice President Dr. Ron Harvey stand next to a display of a traditional Japanese kimono. 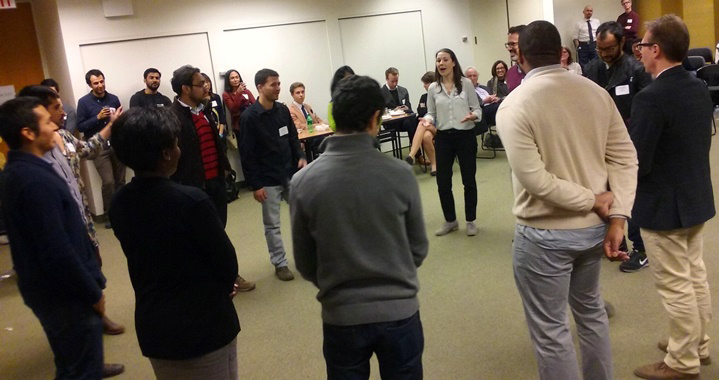 By Jade Stanley —THE CHICAGO CHAPTER of the Fulbright Association held its Fall Welcome on Friday, October 16. This was the biggest Fall Welcome ever organized by the Chapter, with some 120 attendees representing more than 60 countries. The event, sponsored by The Fulbright Association-Chicago Chapter and the Institute of International Education (IIE), was held at the Consulate of Japan on the 10th floor of the Olympia Building on Chicago’s Gold Coast. 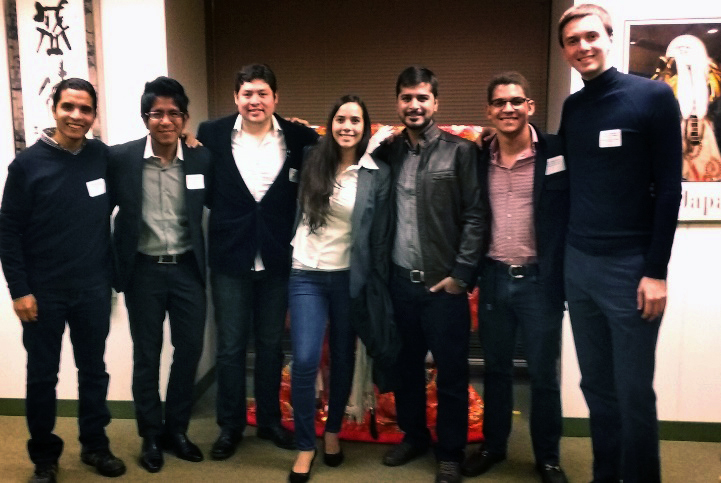 Seven students who came from the University of Illinois at Urbana-Champaign especially for this event: Mohammad Omar Hasseeb (Egypt,) Pericles Alejandro Bayas Mora (Ecuador,) Rodrigo Betanzo Dávila (Chile,) now doing his OPT in Chicago, Caro Chantrill (Argentina,) also doing her OPT in Chicago, Waqar Zia (Pakistan,) Juan Diego Núñez (Dominican Republic) and Aleksey Perekipniy (Russia). Ron Harvey, the Chapter’s Vice President introduced The Consul General of Japan Hon. Toshiyuki Iwado, who welcomed the participants followed by a speech by Mary Mares-Awe, the current Chapter President. In her welcoming speech, Mary thanked the Consulate General of Japan for providing a wonderful space to host our program. She encouraged those present to “use Fulbright as a platform to strengthen bonds, build friendships and promote peaceful coexistence” among people around the world. Atendees exchange ideas over a catered meal. 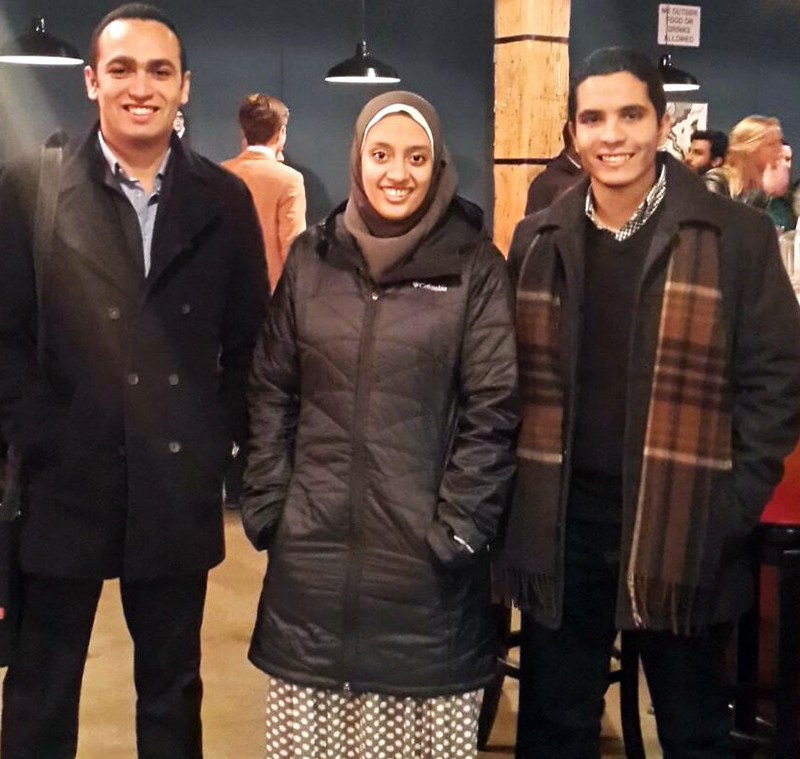 Egyptian Fulbrighters (L-R) Khalid Shaalan, Raghda El-Mogui, and Mohamed Omar enjoyed the iO Theater improv comedy performance. 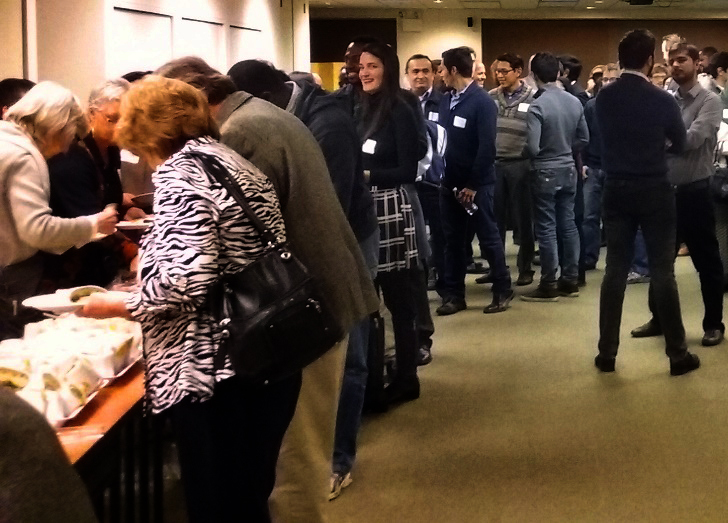 During a catered buffet dinner, attendees had an opportunity to mingle and learn about each other, and to affirm friendships, along with academic, and professional connections that will last for years. The main focus of the Fall Welcome is to provide a friendly forum for newly arrived visiting Fulbrighters and to meet chapter board members, Chicago-area alumni, and to introduce them to a Chicago’s unique cultural aspects. It provides a perfect opportunity for cultural enrichment of both visiting Fulbrighters and association members. One of the cultural legacies of Chicago is the rich history its improvised comedy theater. Attendees at Friday’s event got a unique treat to attend a performance of improvised Shakespeare at the iO Theater. 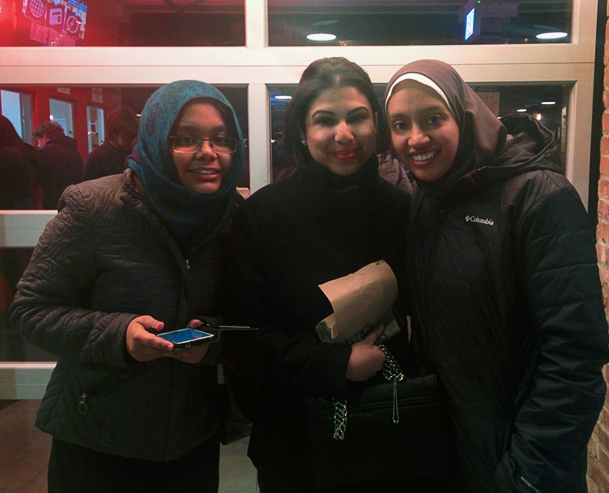 Fulbrighters (L-R) Shafia Imtiaz, Shehrbano Minallah, and Raghda El-Mogui had fun attending the Shakespeare comedy improv performance at iO Theater. Prior to leaving for the theater, Ron Harvey along with Tess Borgerding who is a performer at CiC Theater, and Jill Fenstermaker who performs at iO Theater, set the stage by leading participants in a series hilarious comedy acting exercises. Following the activities at the Japanese Consulate, guests were escorted to the iO Theater as a group using public transportation and were able to view the iO Theater photographs and artifacts reflecting the history of Chicago improv comedy. The Chicago Board members of the Fulbright Association want to thank everyone for coming out and participating in our Fall Welcome and look forward to all of you joining us for upcoming Fulbright Association events.